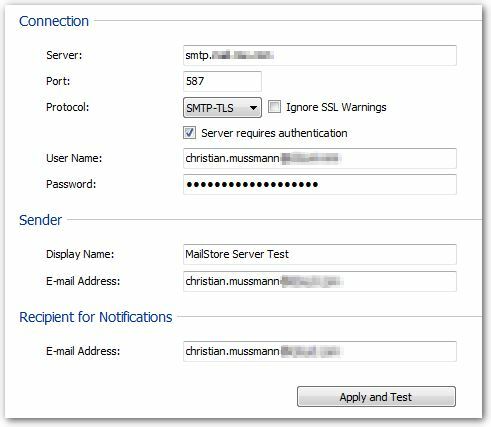 Question: How to schedule and send a MailStore Server status report by e-mail? 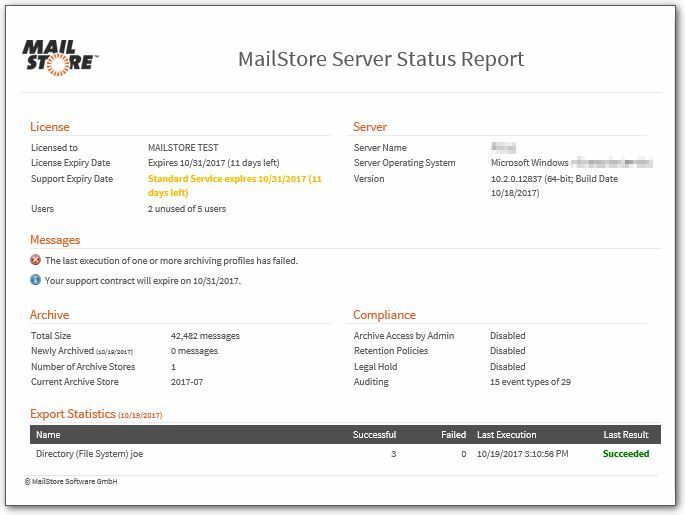 Answer: In MailStore Server you can schedule a STATUS REPORT and send this report by e-mail according to a selected schedule. In order to accomplish follow basically two steps. Here you define the "Connection" credentials, "Sender" details and the default "Recipient for Notifications" e-mail address. The credentials depend mainly on your mail server. If the server requires authentication you may need to specify an application specific password. 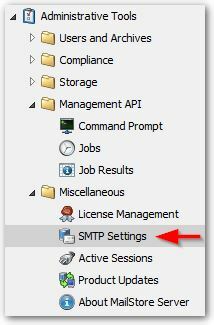 "Apply and Test" will submit an e-mail to the recipient to verify if the settings are correct. Click on the page the dropdown selector "Miscellaneous" and select "Send Status Report". 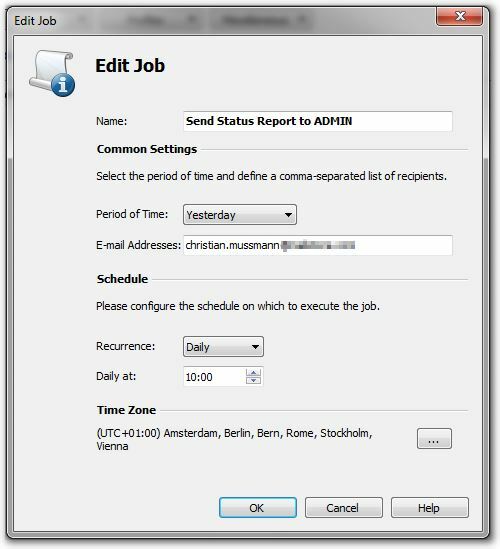 Fill in the details (like the period of time, e-mail adresses, schedule and time zone) in the dialog "New Job", or "Edit Job" respectively. 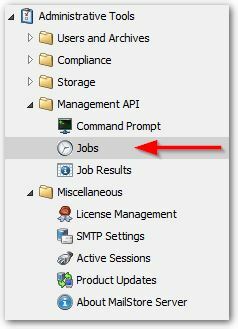 Tip: If you need to send to various recipients on different schedules you should create multiple jobs. The report language is dependent of the operating system language used where MailStore Server is running in. This is usually the system level. You can check the setting of the used language by reviewing the settings under "Control Panel > Region and Language > Change display language", then choosing "Administrative" tab. Under "Welcome screen and new user accounts" click the button "Copy settings...". 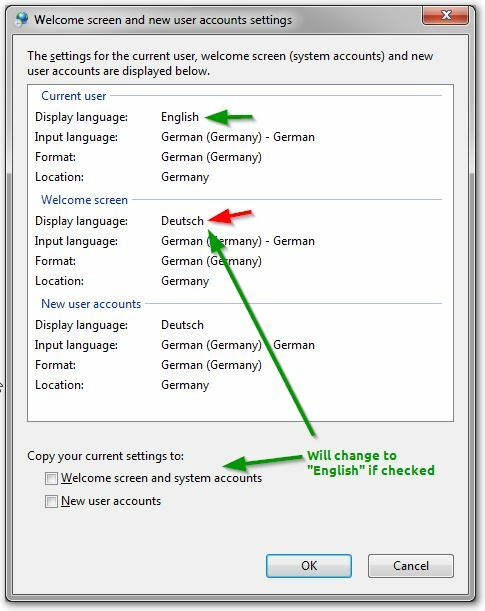 A change can be initiated, if a languages differ, by setting the "Welcome page and System accounts", and confirming with "OK". A reboot of the operating system is needed for changes to take effect.